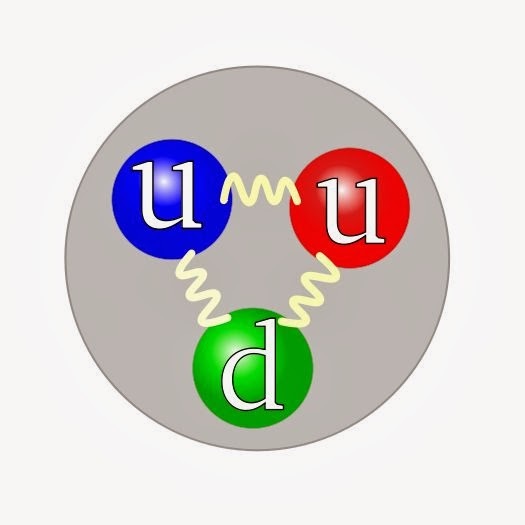 The quark structure of the proton. Credit: Arpad Horvath / Wikipedia. Officially, the radius of a proton is 0.88 ± 0.01 femtometers (fm, or 10-15 m). Researchers attained that value using two methods: first, by measuring the proton's energy levels using hydrogen spectroscopy, and second, by using electron scattering experiments, where an electron beam is shot at a proton and the way the electrons scatter is used to calculate the proton's size. But when trying to further improve the precision of the proton radius value in 2010 with a third experimental technique, physicists got a value of 0.842 ± 0.001 fm a difference of 7 deviations from the official value. These experiments used muonic hydrogen, in which a negatively charged muon orbits around the proton, instead of atomic hydrogen, in which an electron orbits around the proton. Because a muon is 200 times heavier than an electron, a muon orbits closer to a proton than an electron does, and can determine the proton size more precisely. This inconsistency between proton radius values, called the "proton radius puzzle," has gained a lot of attention lately and has led to several proposed explanations. Some of these explanations include new degrees of freedom beyond the Standard Model, as well as extra dimensions. Now in a new paper published in EPL, physicist Roberto Onofrio at the University of Padova in Padova, Italy, and the Harvard-Smithsonian Center for Astrophysics in Cambridge, Massachusetts, has suggested that the muonic hydrogen experiment may be providing a hint of quantum gravity. He has proposed that the proton radius puzzle can be solved by considering a new theory of quantum gravity that is based on the unification of gravity and the weak force, also called "gravitoweak unification." In this theoretical scenario, conventional Newtonian gravity holds at large distances, but morphs into a different kind of gravitational interaction at very small scales. Specifically, the strength of the gravitational interactions is equal to the strength of the weak charged interactions that occur among subatomic particles. The weak charged interactions can be considered as manifestations of the quantized structure of gravity at or below the Fermi scale. As Onofrio theoretically shows in his paper, quantum gravity of this nature contributes an additional binding energy to the muonic hydrogen experiments, which explains the smaller proton radius value. In these experiments, the proton radius value was measured in terms of an energy difference between two energy levels, called the Lamb shift. Onofrio calculated that the gravitational energy contribution in the atomic hydrogen experiments is about two orders of magnitude smaller than in the muonic hydrogen experiments, due to the electron's smaller mass compared to the muon. Onofrio evaluated that the energy contribution should be noticeable when measuring the Lamb shift of atomic hydrogen, and its absence in the data could imply the presence of a flavor-dependent interaction, similar to what happens already for the well-known charged weak interaction. "Muonic hydrogen is unique in that it probes small distances at an unprecedented precision, so it may pick up any small force acting between the constituents," Onofrio told Phys.org. "Since the explanation I provide relies on the mass of the nuclei, complementary tests may be performed on variants of muonic hydrogen currently under experimental study, more specifically the measurement of the Lamb shift in muonic deuterium, and muonic helium spectroscopy. In the EPL paper, I make a definite prediction for muonic deuterium, for instance." Perhaps the most exciting outcome of this work is that it shows that muonic hydrogen may be used to test possible scenarios of gravitoweak unification, with weak interactions providing evidence of gravity's effects at very small scales. "This work shows that the combination of high-precision spectroscopy and the use of exotic atoms with size in between ordinary atoms and nuclei may open a novel way to test physics at the attometer scale, a scale at which, according to my conjecture developed in a former paper, quantum gravity is acting also under the form of what we now know as weak interactions," Onofrio said. Onofrio plans to continue to pursue the gravitoweak conjecture in various directions, and to investigate how it matches with what we know from the Standard Model of particle physics in which weak interactions are mixed with electromagnetic ones. He has outlined the future research landscape in a second paper, listed below.